The Solstice is coming! The Solstice is coming! Winter Solstice arrives this Sunday, December 21, at 5:04 p.m. CST in the U.S. (11:04 p.m. Greenwich time). And for those in the southern hemisphere, this day brings the Summer Solstice. 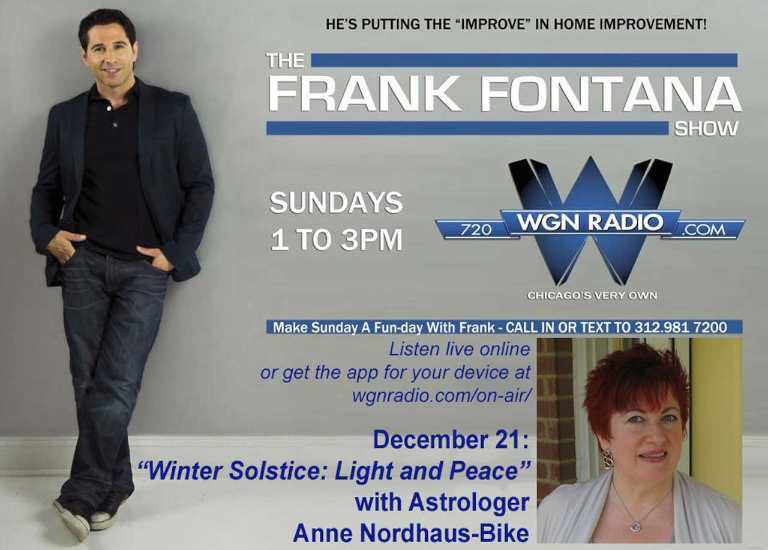 To celebrate this special “power day,” WGN Radio host Frank Fontana has invited Anne to return to his show this Sunday, December 21. The show airs on WGN Radio AM 720 from 1 to 3 p.m. Chicago time. Listen live on your radio if you’re in the Chicago metro area, or listen online on any computer or mobile device, from anywhere in the world, at http://wgnradio.com/on-air/. Frank and Anne also will discuss the longtime association of the Solstice with light as well as peace. “With all the extra tasks and activities that fill our lives in December, many people find the holidays stressful at times. Simply being aware of the special energies available at this deeply meaningful time of year can help us all relax and “keep the peace” in our homes, in ourselves, and with others—no matter how stressful life may become,” Anne added. Listeners will be welcome to call in with questions and comments at (312) 981-7200.